... that the BSC Library has a collection of more than 5,000 children's books? While intended primarily for education majors, the "Juvenile Collection" is also a useful resource for members of the BSC community who have children, younger brothers or sisters, or simply a youthful take on life! The collection is located on the ground floor of the library. It includes both fiction and non-fiction books, any of which may be checked out for one week at a time. 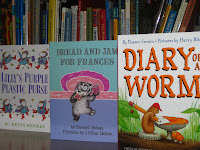 Recent acquisitions include the top 100 picture books (from School Library Journal's list) not already owned by the library. 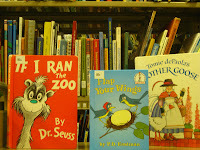 Please feel free to browse through the children's books next time you're in the library, and relive your childhood with a refreshing dose of Maurice Sendak, Tomie de Paola, or Dr. Seuss. "This is June, the month of grass and leaves..."
... so wrote Henry David Thoreau. For some strange reason, he neglected to note that it is also the month that summer school begins at BSC. As the summer term gets underway, we hope you will have a chance to make use of the Library and its re-designed website. Library hours during the summer are as follows: Monday - Thursday: 8:00am - 10:00pm Friday: 8:00am - 5:00pm Saturday: 1:00pm - 5:00pm Sunday: 2:00pm - 10:00pm We've opened up a new space on the ground floor of the Library, a "screening room" which can be reserved by students interested in watching videos on the big screen or editing audio & video files. There are some important changes to the website as well: we've provided a "quick search" option for the library catalog (so you can look for works by Thoreau, among other things); a direct link for people to check their library accounts; and the option to chat with a librarian. 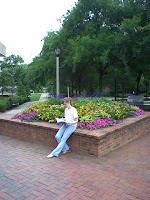 Links to the Library's Blog, Podcasts, and Facebook page run across the bottom of the homepage. And in response to student input, several of the Library Research Tools now have new names (Databases, Ejournals, Research Guides, and Research FAQs). We continue to be interested in your feedback and your suggestions for improving any aspect of library service - either via this blog, through the library's suggestion box, or in person. Here's to a serene, sunny, suggestive summer!